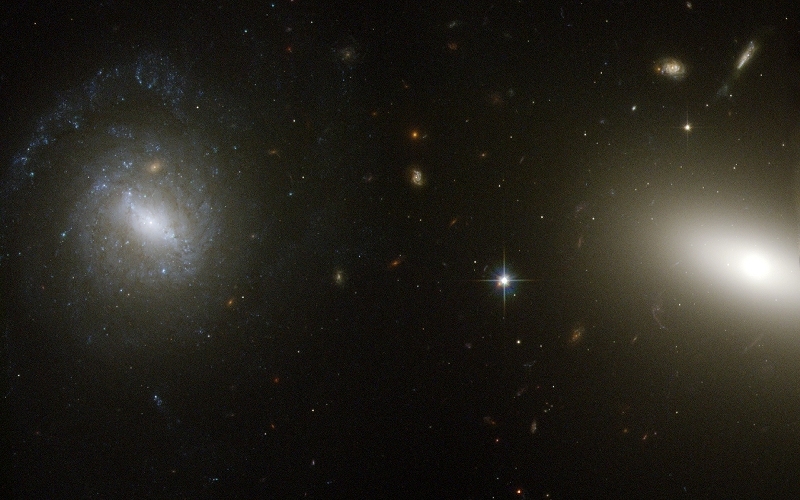 HCG 7 is a small cluster of four large galaxies in the equatorial constellation Cetus. HCG stands for the Hickson Compact Group catalog which consists of 100 entries - in this case: galaxy groups - which had been observed and cataloged in the year 1982 by Paul Hickson. One of the most famous members is Stephan's Quintet (HCG 92). HCG 7 is a group of galaxies some tens of million light years away. It is interesting in terms of galactic evolution, due to the manifold of galactic stages of stellar and dust formation, it offers to observe: One galaxy is a spiral galaxy, another is a red spiral or an older spiral galaxy, one is a transitional prae merger and the fourth is an elongated elliptical galaxy. This quartet is weakly gravitationally bound together. The members rather sit on different depth levels. NGC 197 shows some merger activity and had (probably) exerienced an closer encounter with the elliptical galaxy NGC 198 (in the north of HCG 7).